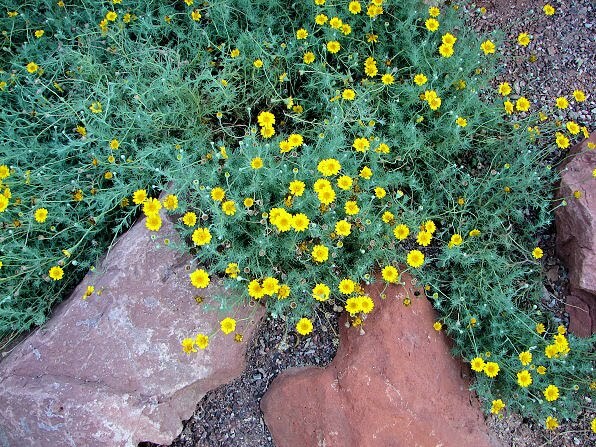 To save on mowing and on water, try xeriscaping at least part of your yard. That means taking out (or covering up) the grass & putting in rocks and plants that can take long periods of drought. You probably won’t have to water these plants at all after the initial planting. A bonus is less lawn to mow. You can sit back with a tall glass of iced tea or lemonade a lot sooner! Put in a patio or extend the one you have with a variety of materials. Widen the driveway similarly. Put in a wide winding sidewalk. Put in accent gardens near a tree or other focal point. Extend the gardens you have already by bringing them outward in a sort of paisley shape. Lay a garden hose to make a pleasing curve to guide you. You don’t have to plant the whole area. Choose plants that are drought tolerant and fill in the garden area with mulch. Ask your county extension service for lists of drought tolerant plants that can grow in your planting zone. Click here for some beautiful examples of xeriscaping at Houzz. Check out my article on Low Maintenance Landscaping for some practical ways to xeriscape! Save Your Trees from Drought is a step-by-step way to keep your trees. Trees are more important to save than you lawn during a drought, if you were wondering. Take a look at your yard and decide where you can make some changes. Even if you change just one area each year, it’s an important goal. Saving water saves money too! Super! A patio works well with this! It takes some work to do it, but a little bit of lawn can be taken out each year. We have done this very thing. We have some grass for the future kids to use for play, but we have laid some rock and expanded our patio to limit our grass. It does save on watering and mowing.